This morning I found this letter in TODAY’s Voices section: ‘Help foreign spouses get PR to better overcome hurdles‘. I’ve screencapped the article, because I expect that TODAY will remove the letter. “What we, and I suspect many other transnational couples, need from the government is an acknowledgement of family migration that transcends the fear of sham marriages and people abusing the system and trying to get social welfare. According to the National Population and Talent Division, four in ten marriages registered in Singapore last year were transnational. This doesn’t include couples who, like Calum and I, were married overseas before coming to Singapore. Transnational families are not a tiny minority who can be ignored for much longer. I alerted TODAY to the plagiarism at about noon today. The editor thanked me for my email and requested permission to forward my email to the letter-writer Eunice Li to get her response. I agreed. I haven’t heard back from TODAY yet, and at the time of the writing of this blog post the letter is still up on their website. I wasn’t angry when I first saw the plagiarised article this morning. I was more curious as to why someone would bother plagiarising a letter to a newspaper’s forum pages. I would have been satisfied with an apology from the plagiarist and the newspaper removing the article. What angers me now is that Ms Li is not only not sorry for having copied my writing word-for-word, but characterises it as having “helped me raise awareness”. Not only is she unrepentant, she appears to expect me to be grateful! Apart from the fact that I don’t require any unsolicited “help” to raise awareness of an issue I am perfectly capable of speaking out on myself, as a freelance journalist my words are how I earn a living. I might not have earned any money from my blog post, but that was my choice. So do I mind that my words were stolen from me? Yes. And what I mind most of all is that the writer does not seem to understand what she’s done wrong: she has even updated her blog to share the plagiarised piece. I’m assuming that Ms Li only decided to leave a comment on my blog after receiving an email from TODAY. Even if that’s not the case, a person who has a blog to catalogue her “writing achievements”, who was identified by The Straits Times as Writer of the Week last year, and who says that she is “still thinking” about compiling her writing into a book, should be more aware about the importance of ownership and respect for other writers. Update @ 6:54pm: Upon seeing the below comment from Ms Li I feel like I should make it super clear – I have to be especially sensitive about my writing because it is how I earn a living, but one should just not plagiarise, period. Like, NEVER EVER. Update @ 1:20am, Wednesday: TODAY has amended Ms Li’s letter. The new version can be found here; she has rewritten the parts of the letter that were previously plagiarised. TODAY has also added a note below the letter to acknowledge the plagiarism and to link to my blog post. Although I would have done things very differently if I were TODAY, I don’t really want to drag the matter out and am choosing to move on. I guess it’s easy to become a letter writer of the week when you rely on the words of articulate writers rather than develop your own voice. Tsk tsk – such an outbreak of ego-tinged exasperation! A part of me wants to tell her that she’s damaging the advocacy she claims to espouse. How can someone of questionable ethics hope to call for justice when their very actions ARE unjust? I wouldn’t be surprised if naysayers to the issues of transnational couples point to this instance to paint these couples’ advocates as unreliable reporters of dubious moral character. Just for your info, the occupation section has not been updated in my Facebook page, so that is not what I do now. That’s not even the point. Your current occupation isn’t the point; her occupation isn’t the point too. The point is that you stole someone’s work. It’s theft – pure & simple – whichever way you look at it & however you seek to justify it. Eunice, theft is theft – whether it’s an item from a shop or words written by someone else. No amount of defensive “justification” from you is sufficient. Go look up the definition of the word PLAGIARISM and commit it to memory. That facebook post of hers is also very passive-aggressive – as if she is only sorry because it has something to do with your livelihood (it shouldn’t), and it’s somehow your fault for not advertising that you’re a freelance journalist. Wrong and wrong. Not sure why she seems to think that if someone were not a freelance writer, that it is then okay to plagiarise their words. 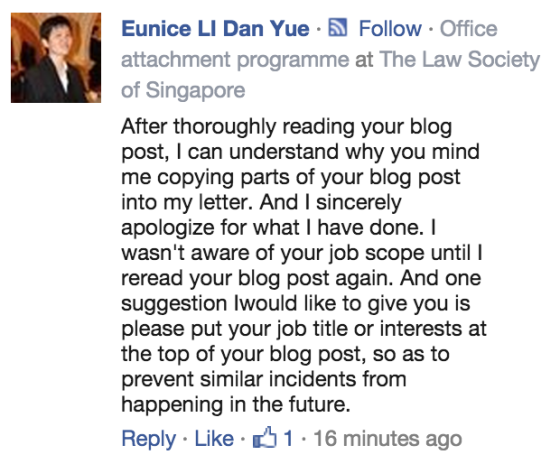 I would like to say to ms eunice, the blogger does not have to put her occupation on her blog to prevent plagarism. Plagarism or copying is wrong, and any primary school kid will tell you that. I fail to see the link between her occupation and her words being copied. Im no journalist but if someone copies my blog entry verbatim and passes it off as their own, I reserve every right to be pissed. Yes, your comments noted. Today has already amended my letter. Please find the link below. The parts have already been completely removed, and totally replaced with my own wordings. May be jumping the gun but she’s on attachment at the Law Soc. Does she need to meet certain criteria (like media mentions) for the attachment? Actually, I have already removed my outdated occupation from my Facebook page, so it should not even show up there. May I suggest the following as a possible form of response to Kirsten, or anyone else you may plagarize in future. Should you so choose to. Alternate with proper nouns as needed, with your future victims. My sarcasm applies implicitly. I regret my ill conceived and misdirected attempt at highlighting the topic of Translational Singaporean Couples, in the 28th October 2009 edition of the TODAY newspaper, titled “Help foreign spouses get PR to better overcome hurdles”, published in the Voices section. I admit to the use of intellectual property from your blog /, that you so deservedly hold the rights to. In hindsight, I wish I had obtained your approval to use portions of your blog post, and for that I apologize. I sincerely regret my action and seek your acceptance of this apology, and the efforts I am making to retract my letter from the publication. I am in the process of informing, apologizing and, retracting my letter in whole from the TODAY publication. May I take this inopportune moment to tell you how much I appreciate your opinions, that you so commendably include on your blog. I will contact you tomorrow to confirm the retraction, and to invite you for Tea, to personally convey my regret. I think we have similar views on some the most important social issues of the present. Best reply read so far. If only Ms Li were this eloquent. Judging by her comments thus far, it would be a far reach to expect her to come up with an apology letter to this effect. Then again, I suppose she could always just plagiarise that too. For the uneducated on plagiarism, it is considered a severe offense by any counts. If you were in school, you could be expelled. If you were in a job, you could be fired. If you published it without gaining prior written permission and authorisation from the author, and in some cases conferring rights, you could be subject to legal proceedings. This whole episode was so weird. I don’t even understand the thinking that went on behind Eunice’s actions.